Fill out the form below and get your ticket today! The email entered below will be sent event information, please enter information for a central contact for your team. Billing contact information will be entered at checkout. 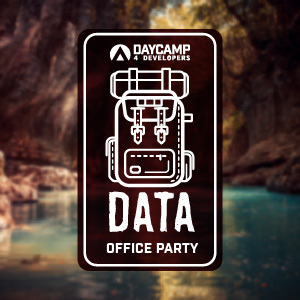 This product is a Office Party ticket for Day Camp 4 Developers: Data that takes place on May 31, 2019 from 9:00 AM – 3:00 PM CDT. Access to the Slack channel to be able to talk to other attendees, the speakers, and the sponsors. We use Zoom Video Conferencing. You will be sent an email with login information for the event. After the event, we will send you an email within 7 days with links to download your copy of the videos. EICC, Inc. Refund Policy All ticket sales are final. Tickets are transferable. If you sell/gift your ticket, please let us know, we are happy to transfer ownership on our end.